Both species of mountain yellow-legged frogs are listed as endangered under the U.S. Endangered Species Act. Aiming to rebuild rapidly disappearing populations of a California native frog species, scientists from UC Santa Barbara are collaborating with wildlife agencies and two zoos in a unique rescue effort. Though historically abundant, mountain yellow-legged frogs have been extirpated from more than 92 percent of their geographic ranges — high-elevation aquatic habitats — with many of the remaining populations depleted. Declines were first recognized during the 1970s and have accelerated markedly since the 1990s. Both species of mountain yellow-legged frogs (Rana muscosa and Rana sierra) are listed as endangered under the U.S. Endangered Species Act. A major culprit in the frogs’ dwindling numbers is a deadly fungal disease called chytridiomycosis (chytrid). The highly infectious chytrid has caused more than 200 species of frogs and salamanders to become extinct within the last 15 years. Concern about chytrid and its disturbing impact on the frogs sparked the unique collaboration between UCSB, the National Park Service, the U.S. Fish and Wildlife Service and San Francisco and Oakland zoos. National Park Service biologists in August collected and emergency evacuated critically endangered tadpoles from remote locations in Sequoia and Kings Canyon National Parks in the high Sierra. The tadpoles were airlifted out by helicopter and delivered to zoo biologists in Three Rivers, who made a four-hour drive with 270 tadpoles to the Bay Area, where the rare animals are now housed in quarantine at both Oakland Zoo and San Francisco Zoo. The tadpoles have successfully morphed into healthy mountain yellow-legged frogs. Now zookeepers are specially treating the amphibians for chytrid with a special type of bath that helps their bodies resist the deadly disease. In addition to the baths, San Francisco and Oakland zoos are “head-starting” the tiny juveniles, raising them into healthy frogs better-equipped to survive predators and chytrid when they are released back into the wild. 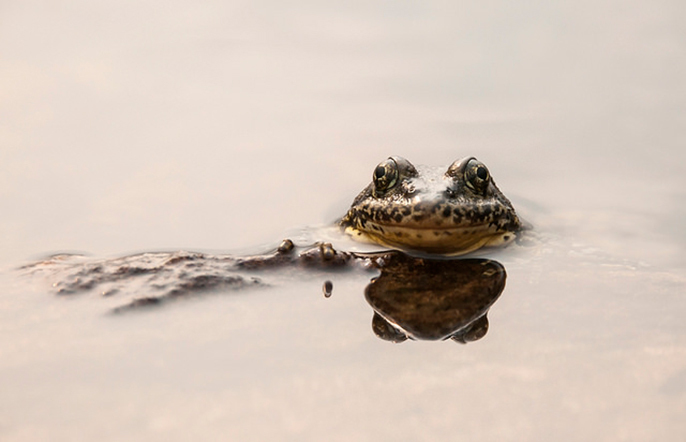 The joint endeavor to save a native California species and give it legs to thrive and repopulate in the wild hopes ultimately to see flourishing frogs in healthy habitats. If program efforts continue as planned, the goal is to release the yellow-legged frogs in Sequoia and Kings Canyon National Parks in the summer of 2016. “Oakland Zoo and San Francisco Zoo are committed to helping save these frogs, a California heritage species, a local animal that lives just a few hours away in the Sierra Nevada,” said Victor Alm, zoological manager at Oakland Zoo. Mountain yellow-legged frogs in the Sierra Nevada occur between the headwaters of the Feather River and the headwaters of the Kern River. Rana sierrae occupies the northern and central Sierra Nevada south to the vicinity of Mather Pass (Fresno County), whereas Rana muscosa occupies the Sierra Nevada south of this area.